Where can you fine more of theshyfox's work? 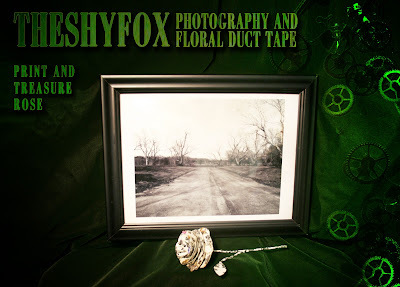 So what is theshyfox? Not to be contained by one category, she is a photographer, internet addict, youtube vlogger, singer, cinematographer, gofur, makeup artist, costumer, rennie, steampunker, nerd, loving daughter, sister, and girlfriend. Break out your adventure maps and gear up your airships! 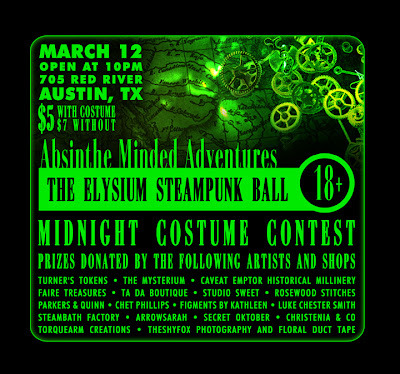 On March 12th, the Elysium Nightclub is hosting a Steampunk Ball with an adventurous twist! Admission is $5 with costume and $7 without. Bring out the global nomads, the absinthe inspired inventions and the noble nobles that fund these daring quests of discovery. While things are still being nailed down as far as plans go, we have quite a growing list of those shops donating to the costume contest prize pool! Donations will be provided by the following shops and more! Leading up to the Steampunk Ball I will post pictures and details of the items that are being donated for the costume contest so check back often and see these awesome creations! The Elysium is now 18+ on Saturdays too so bring your friends! The Ball is being held right around when SXSW is kicking off so dress to the nines and show those who happen to pop by what Texas Steampunks can do!